We are delighted to announce that Lion Ark has been selected for the San Diego Film Festival in Southern California. 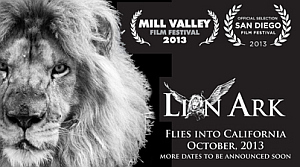 Lion Ark will screen at Raindance Film Festival, London, on October 1st; Mill Valley Film Festival, northern California on October 5th; San Diego Film Festival on October 6th; and again at Mill Valley Film Festival on 8th. We have more screenings in the United States to announce but have to wait until each festival makes it’s official announcement – thanks for your patience.